A barber has taken his own life after setting himself ablaze on a road leading to Omole Estate, near Akiode Bus Stop, Lagos. He died while he was receiving treatment at a hospital. The barber had reportedly emerged on the road around 4:30pm on Wednesday holding a five-litre jerrycan of petrol. He subsequently poured the fuel on his body; struck a match and lit himself. Our correspondent learnt that a passerby, who was standing a few metres away from the scene, rushed to put out the fire. The young man, who was identified simply as Ahmed, was said to have died shortly after he was rescued from the scene around 5:00pm by officials of the Lagos State Ambulance Services. Before the arrival of the emergency officials and policemen from the Ojodu Division, it was gathered that a mild drama played out. Gabriel stated that Ahmed was running a barber’s shop until his life recently took a drastic turn. “I saw him pouring the fuel on himself but I thought it was water. 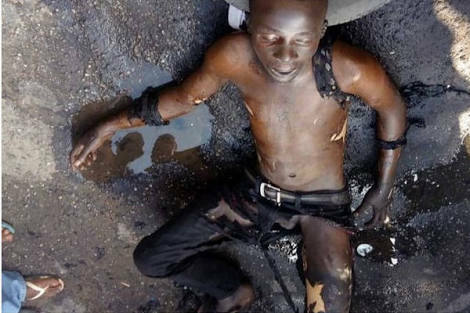 Within seconds, he brought out a pack of matches from his pocket and set himself ablaze. Fortunately, a food seller close to the gate had some water. A man quickly took the water to put out the fire. Some people and I joined him. It was strange to me,” he added. A resident, who introduced himself simply as Tolu, explained that he saw Ahmed walking along the road on Monday and advised him on the need to turn a new leaf. “He was a barber and used to have a shop around Akiode. He closed the shop sometime ago and started roaming about the neighbourhood. He smoked a lot which I think affected his brain. Another eyewitness, Samuel, described Ahmed as a drug addict, saying that he had been mentally unstable for some time. “Many people around here know him. He used to be a decent person before he suddenly changed as a result of drugs. He lived with his family within this community and they are aware of his plight,” she said. A senior emergency official told our correspondent on Friday that Ahmed gave up the ghost while he was receiving treatment. “It is unfortunate that we could not save the man’s life. He died while receiving treatment and his corpse had been handed over to his family,” the official disclosed.